Being on the Fix doesn’t feel like there are restrictions. Ok, so yes, there are restrictions. You only eat the amount of food that depends on how many containers you can have per day. You can’t have a lot of the foods that we think are delicious but that are actually really unhealthy for you. The junk food… you know the stuff I mean. Ok so maybe there are restrictions. But it doesn’t feel like restrictions. Why!? Because I always felt full. I always felt like I had enough food. It might not have been chips, or icecream, or cookies, but it the foods I did eat were filling. I really did feel like the picture says “stuffed, happy, and wondering how I was going to eat all this food.” Don’t starve yourself or feel like you are restricted. Eat healthy and feel full. 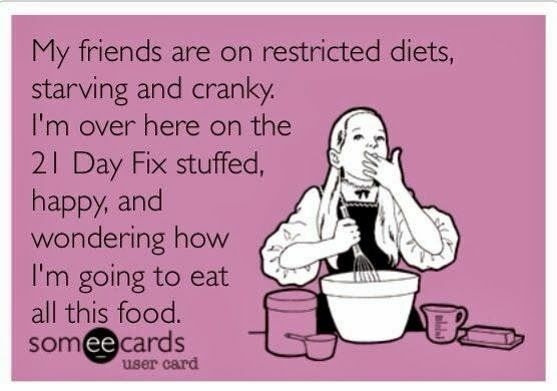 These posts aren’t to convince you to do the 21 Day Fix. They are to encourage you to take a step to eat a bit healthier and get active. I think you should be able to have treats once in a while, but I know for myself I can get carried away with the treats and french fries and chippies… I have discovered that the 21 Day Fix helps me to get it under control so that I can enjoy them once in a while. This works for me… have you found what works for you? Do you think it can be a life lasting change?